The Witches of Black Branch harvest body parts from their victims and imbue them with magic powers. You and your coven are on the hunt. Sever hands and pluck out eyes—collect the most trophies and become the Sickest Witch. This card game is a simple expansion to the BENEATH RPG series. Hit Points (HP): The “life” on an enemy. Armor Class (AC): The strength of an enemy’s armor. Roll with Advantage: Player rolls the 20-sided dice twice and uses the higher number. Roll with Disadvantage: Player rolls the 20-sided dice twice and uses the lower number. Don’t be a Wicked Witch: Announce what attack or ability you are using on your turn before you do it so everyone is clear and the game is fair. Don’t be that Witch who says “oh, I was doing a melee attack” after you know you just want to save that Spell Card that was about to be wasted on your turn. Spread The Bones: Separate the game’s cards by type. There are Witch Cards, Witch Ability Cards, Enemy/Body Part Cards, and The Hit Points Card. 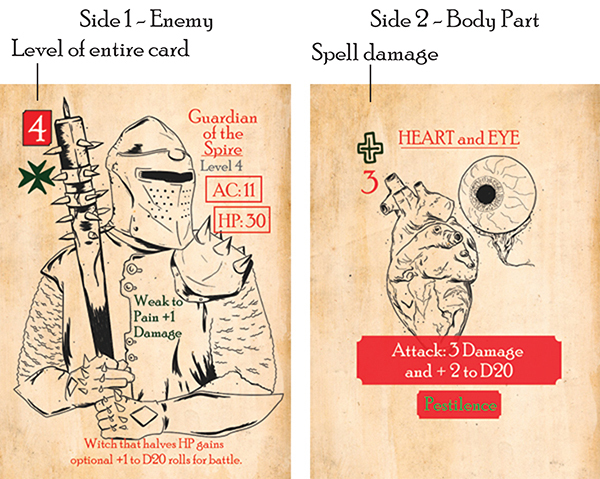 Separate the Enemy/Body Part Cards by their Level (1,2,3,4, and B) listed on the Enemy side (character drawing). You can dictate the length and difficulty of the game by choosing how many Enemy cards (and which level) to place in the game. Use as little as three cards for a very short game, as many as you want for a longer game. Summon the Coven: Each Player gets 1 Witch Card, 1 Witch Ability Card, 1 d4, 1 Level 1 Enemy/Body Part Card, and 1 Level 2 Enemy/Body Part Card. Shuffle and choose these randomly. Keep your 2 Enemy/Body Part cards Body Part face up. They have unique spells you can use during play. Your Witches Mark on your Witch Card and your Witches Mark on your Witch Ability Card must the same numbers. Make sure your Witch Card has the Level 1 side up and your Witch Ability Card has the Witch Abilities side up. Name The Victims: Now build the Enemy Deck. Separate the Enemy/Body Part Cards by their Level (1,2,3,4 and Boss). You set the length of the game by how many Enemies are in the Enemy Deck. More enemies means a longer game. Randomly select 2-4 Enemy Cards of each Level plus 1 random Boss Card. Make sure the sides with the character drawings are face up. Place these cards in ascending order (Level 1s on top, Boss on bottom). The Enemy Deck is ready. Place it in the middle of the table so everyone can reach it. Begin The Chants: Each Player rolls their d4 and consults their Witch Ability Card to see what numbered ability is active. Place the d4 on top of the Witch Ability Card. This denotes that ability is active. When you use that ability in combat, you remove the d4 and set it next to the card to show your ability is inactive. The Eldest Shall Lead: The Player who has had the largest organ removed always goes first. If no Player is missing an organ, each Player rolls the d20 to see who goes first. Highest number is The Eldest Witch and goes first. The Eldest takes the Enemy/Body Part card from the top of the Enemy Deck and checks how much HP the enemy has. The Eldest places the Enemy/Body Part card on top of the Hit Points Card in order to reveal how much HP the enemy has. Let The Harvest Begin! Starting with the Eldest Witch and continuing clockwise, each Player takes a turn and tries to kill the Enemy in order to claim its body parts for spell casting. The Witch who strikes the killing blow against the enemy claims the Enemy card and flips it over to reveal what Body Part they harvested. The Body Part side has unique spells the Witch can cast in future fights. Read the Spell effect to see what it can do. As the enemy takes damage, track this by sliding the enemy card over the Hit Points Card until the enemy drops to 0 and dies at the hands of the coven. After each Enemy is killed, the Player to the left of the Witch who dealt the killing blow draws the next Enemy from the Enemy Deck and goes first. Play continues clockwise once again. Witches don’t take damage in combat. They’re on a murderous rampage and cannot be stopped. All that matters is the mad scramble for body parts to feed the depraved rituals of the coven and who among them is the Sickest Witch. Optional: On their turn, a Player may also use an ability from their Active Witch Ability Card, unless they are using the number 4 Ability, in which case they skip their turn and recharge a spent spell. All Spell and Weapon attacks are d20 rolls. If the number rolled meets or exceeds the AC of the Enemy Card the attack is a success. Some effects and abilities add bonuses to this attack roll. Note the damage by sliding the Enemy Card over the Hit Points Card to reveal the enemy’s remaining HP. 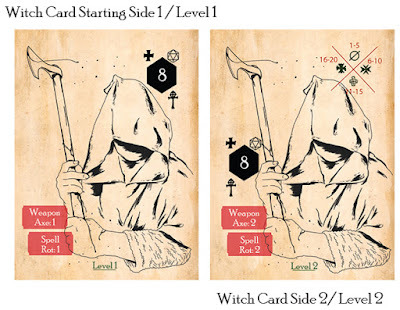 This is important: if any Player rolls a 1 or a 20 during an attack, ALL Witch Ability Cards activate (roll a d4 and place it on your Witch Ability Card). Players may keep their hands of Body Parts secret or demand all Body Parts be visible at all times. Some covens are more secretive than others. The Next Player to the left then takes their turn. Witches continue attacking until the enemy dies. 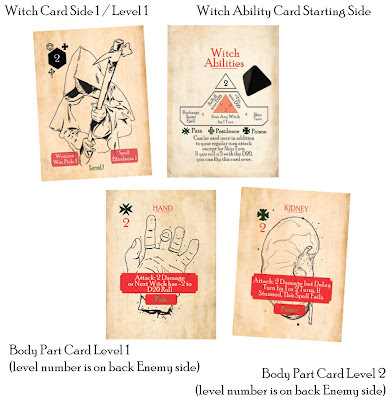 Witch Ability Cards Additional Rules: At the beginning of every fight (every new Enemy card) all Witches activate their abilities by rolling their d4 and placing it on their Witch Ability Card. At the beginning of a fight if a Witch’s ability is already active, they may choose to keep their current ability or reroll their d4 to activate a different ability. Once this Focused Witch Ability is used in combat, flip the card back over to the Witch Abilities side. Once flipped back over the card starts as inactive and must be activated again as normal (if any Player rolls a 1 or 20 at any time on an attack roll). If a Witch enters a new fight while they have a Focused ability active, that card remains Focused until they use the ability. 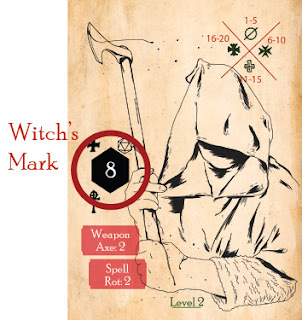 Mark of Madness: Whenever a Player rolls either of their Witch’s Mark numbers (on their Witch Ability Card or their Witch Card) their Witch ability activates, or, if it is already active, the Player flips over the Witch Ability Card to the Focused Witch Ability side. Level Up! 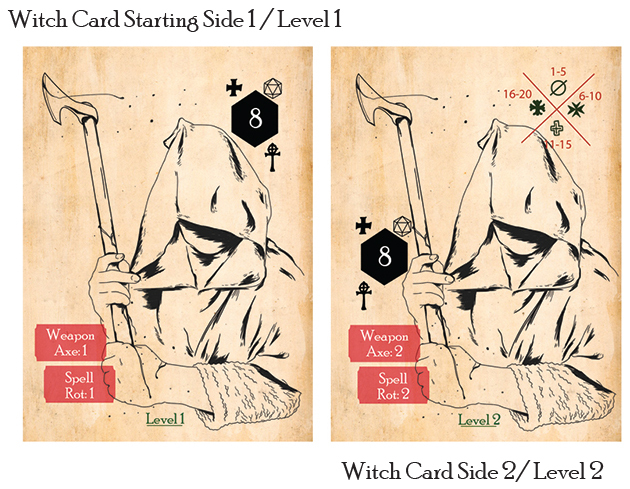 When the first Level 3 Enemy appears, ALL Witches flip their Witch Cards to the Level 2 side. Now whenever they do a Basic Weapon or Basic Spell Attack the Player will roll the d20 twice. The first roll determines if the attack is imbued with a damage type (Pain, Pestilence, or Poison) as determined by the chart on the Level 2 side and the second roll is the Attack roll versus the Enemy’s AC. The Sickest Witch: The game is over after the Enemy Deck is depleted and the final Body Part Card is collected. The Witch with the most Body Parts is declared The Sickest Witch and is the winner. If Witches tie for the same number of Body Part Cards, total up the red numbers in the upper left of each Body Part Card. Whoever scored the most points wins. If there is still a tie, draw a final Boss Enemy Card and the tied Witches clamber to claim this final victim. Whoever strikes the killing blow on this Boss is the Sickest Witch. Enemy/Body Part Cards: There are 52 enemy cards in all, each with their own distinct art and Body Parts on the reverse. There are 12 of each Level (1,2,3,4) and 4 Boss cards. Every Enemy has a weakness as denoted by a symbol on the card and an explanation of the weakness on the bottom. Levels 3,4, and Bosses also have a special effect on the bottom of the card. “Witch that halves HP gains optional +1 to d20 rolls for battle.” This bonus only applies to the current fight and only to the Witch that damaged the Enemy at or below half their HP. These cards have an Enemy on the front and includes their Level, what Spell Type they’re weak against, their AC and their HP. The back of these cards are Body Parts. The Body Part side includes the type of spell it can cast (Pain, Pestilence, or Poison) and any additional effects the spell causes. When using a Body Part spell in combat the card is turned sideways to indicate it has been used. If when making an attack roll using a Body Part spell the Player rolls a 1 the spell is a dud and the Body Part is set off to the side and cannot be used again that fight. Body Part spells refresh at the beginning of a new fight. Additionally, when a Player rolls a 20 on any attack roll that Player may refresh 1 used spell. The number 4 Ability on the Witch Ability Card can also refresh a spent spell at the cost of skipping your turn. Witch Cards: There are 7 Witch Cards. Each has Level 1 and a Level 2 side. On both sides there is their first Witch’s Mark number in a black hexagon. These numbers are from 2-8 and whenever the Player of that Witch rolls that number on a d20 attack roll their Witch Ability Card will activate, or if it is already activated they will flip it to the Focused Ability side. The Witches Mark on a Players Witch and their Witch Abilities Cards must be different. Witch Ability Cards: There are 7 Witch Ability Cards. Each has a Witch Abilities and a Focused Witch Abilities side. On the Witch Abilities side there is a number in a triangle at the top. This is the Witch’s second Witch’s Mark number. These numbers are from 2-8 and whenever the Player of that Witch rolls that number on a d20 attack roll their Witch Ability Card will activate, or if it is already activated they will flip it to the Focused Ability side. The Witches Mark on a Players Witch and their Witch Abilities Cards must be different. 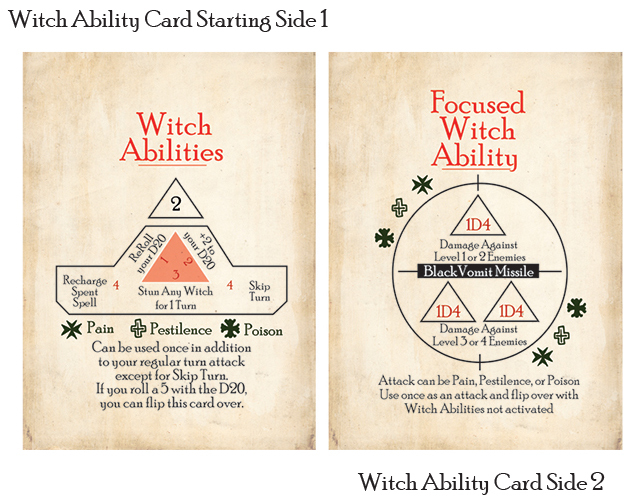 When activating their Witch Abilities card, the Player rolls a d4, consults the chart on the card to see which ability they have activated, and places the d4 on top of the card to show that it is active. When a Player uses an ability from the card they deactivate the ability by taking the d4 off the card and using the ability’s effect. 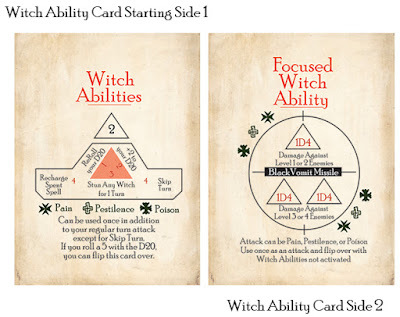 When a Witch Ability card is active and an effect would activate that card, the Player instead flips over the card to the Focused Witch Ability side. Once a Witch uses this Focused Ability the Player flips the card over and the Witch Ability Card is once again inactive until activated. 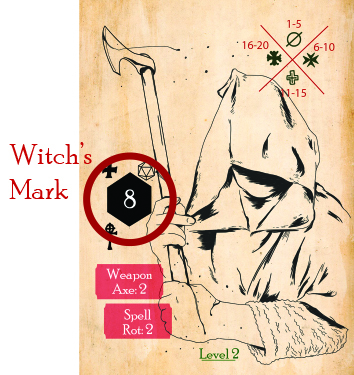 The Stars Are Aright Rules Variant: You can use 6-sided dice instead of d4s in Sickest Witch. On a 5, reroll. 5 means nothing. On a 6, you get to choose which number (1-4) you wish to place on your ability card. Lambs To The Slaughter Rules Variant: for an epic campaign of the sickest slaughter, try playing with 5-6 of each Level enemy plus a Boss. 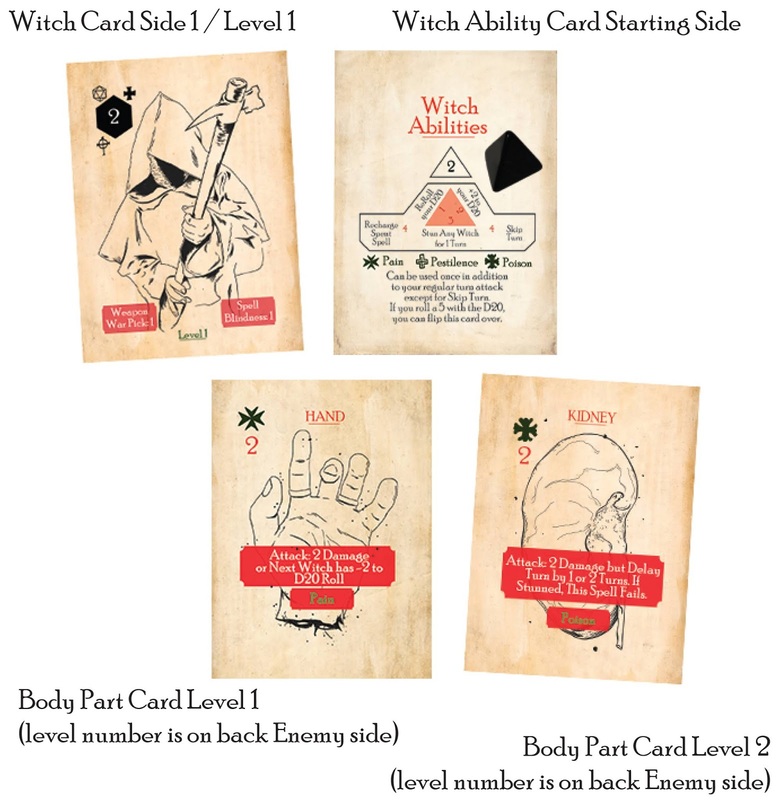 For these games there is an additional rule: Once all Level 2 Enemies are killed, the Witches rest and each receive 1 random Level 3 Enemy/Body Part Card. 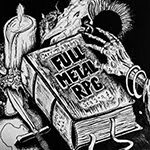 The Number of The Beast Rules Variant: for a more super-charged game you can instead have your Witch Ability Cards activate when ANY Player rolls your Witch’s Mark number. All Belongs to the Coven Rules Variant: friendly psychopathic covens can trade body parts between Witches at each Witches leisure. Spread The Bones: Separate the game’s cards by type. Player begins with 1 d4, 1 Witch Card, 1 Witch Ability Card, and the Hit Points Card. Player starts with 30 HP using the Hit Point Card under their Witch Card. Name The Victims: Now build the Enemy Deck. Separate the Enemy/Body Part Cards by their Level (1,2,3,4 and Boss). Player takes 3 random enemies from the Enemy Deck and lays them out in a row, Enemy sides facing up. Player places a d4 on each Enemy Card. These are their Hit Points, always starting with 4. Let The Harvest Begin! Player attacks each enemy, one at a time, trying to beat their AC. Player can choose which enemy they wish to attack first. Each time the Player misses, the enemy counter attacks. This is the only time the Enemy attacks. The Player cannot attack the same Enemy twice in a row unless they are the only enemy left. Your Pain, My Pleasure: If Player rolls a 20, they do double damage, they regain 1 HP, and their Witch Ability Card activates. If Player rolls a 1 their Witch Ability Card activates. If their Witch Ability is already activate they may re-roll the d4 for a different ability or flip the card to Focused Witch Ability as per the normal rules. Spells and Abilities act as normal, except you ignore the rules for skipping turns. When an Enemy rolls, 20 does double damage. If enemy rolls a 1, enemy takes 1 damage. Once an enemy dies, the Player claims their Body Part spell which can be used once during a battle. At the beginning of every fight, Player activates their Witch Ability Card. Levels 3 & 4 Enemies have 2d4 as HP, randomly pick which only has 1d4 for HP. Any Body Part spell that doesn't makes sense for single Player should be treated as a 2 damage spell with no Pain, Pestilence, or Poison bonus. If a card effect would normally stun a Witch it instead stuns an Enemy. Body Part spells can only be used once per game. When the boss is encountered, the Player renews every spell card and they can be used once more as the Player unloads on the boss. Battle 1: two Level 1 and one Level 2 Enemies. Battle 2: three Level 2 Enemies. Battle 3: one Level 2 and two Level 3 Enemies. Battle 4: two Level 3 and one Level 4 Enemies. Battle 5: three Level 4 Enemies. Boss Battle: The Boss has 5d4 HP. Bosses always counter attack. Easy: Enemies hit on 11 or more with d20. Kill 1 Boss to win. Medium: Enemies hit on 10 or more with d20. Kill 1 Boss to win. Hard: Enemies hit on 9 or more with d20. Kill 1 Boss to win. Brutal: Enemies hit on 8 or more with D20. Kill 2 Bosses, one at a time, to win. Insane: Enemies hit on 7 or more with D20. Kill 2 Bosses, one at a time, to win. Last Boss must be the Plague Knight. Using Sickest Wizard is easy. It ramps up the tension of the game by making each round count more and adds new abilities to your hand. There are new Wizard cards that you can swap out your Witches with. And there are new level 1,2,3, and 4 enemies you can shuffle into the game. Some of them have severed heads. Fun! Separate the expansion cards by type and add them to your Sickest Witch decks. The Cards with the crystals on their backs are the special Invert Deck. Shuffle these and place them on the bottom of the Sickest Wizard box (crystal side up) within easy reach of all Players. You young witches have opened a portal into a strange world, The Invert, and can reach into its twisted depths to call forth abominations and treasures to use in your quest to become the Sickest Witch. All Players draw one of the Invert Deck cards at the beginning of the game and they keep this card as a tool to use during battle. These cards are used INSTEAD of the Witch Ability Card. Some of the cards will use four-sided dice which come with Sickest Wizard. With the Sickest Wizard Expansion, the Witch that gets the killing blow on an Enemy claims their Body Part as normal, but ALSO draws one card per Player from the Invert Deck. The Player keeps the one card they want, and then passes the rest of the drawn Invert Cards to a Player of their choice. That Player takes a card and passes the rest to the next Player they wish. It’s a draft. Do this after every Enemy killed. Cards from the Invert Deck are one use only. Once they are used, they are put aside in a communal discard pile. They are never used again until the coven begins a new massacre to re-name the Sickest Witch.